Nelson, the bank robber featured in my first documentary, Road to Return, was consumed with an overriding compulsion to visit the bank he robbed after he was released from prison and APOLOGIZE. He told me the story. Sitting around a conference table in a small town community bank tucked in the rural banks of Louisiana, Nelson and the bank’s employees shared pictures with each other of one another’s families and swapped stories of their lives. They were all crying. The teller, to whom he had held the gun to 12 years prior, finally looked up at him with tears streaming down her face and said, “Thank you. Thank you for coming back here and apologizing because for 12 years I have not been able to get you out of my mind, and I have lived in fear you would come back and kill me.” As he told me this, I thought to myself about the brilliance in the simple act of forgiveness. I immediately understood the implications, not only for his heart to be unburdened from the weight of knowing he harmed innocent strangers, but also for the victim to be released from the terror of her nightmare. She was finally able to let go of her obsessive thoughts and fears. In my excitement, I began to share his story with others who knew far more than I did. I was told that what happened in that bank’s conference room was something called “Restorative Justice” – something tribal cultures had long practiced by bringing offender and victim together in dialogues. New Zealand was even beginning to practice these principles within their criminal justice system. The day Nelson told me his story, I knew I wanted to make a film to explore how it might be used to affect positive change within our criminal justice system. That was sixteen years ago and restorative justice principles were barely on the horizon in our country. Today, with the hard work from researchers and advocates, we are beginning to see bits and pieces of restorative justice applied here in the U.S. But we have a long way to go. Restorative Justice experts make a strong point that in no way does forgiveness from the victim have to be a part of restorative justice. What helps the victim’s healing so much is the dialogue itself. While Nelson’s story gave me the idea to compose a film about restorative justice, I kept meeting extraordinary people who had taken it a step further. 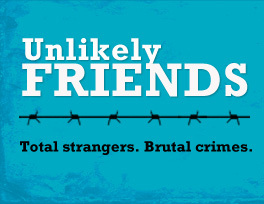 Unlikely Friends is a film that shares the stories of unique individuals who find themselves bridging the gap between friend and enemy through not only forgiveness but friendship.